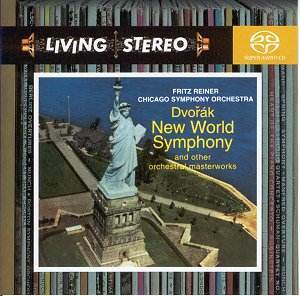 There�s still an inevitable sliver of tape hiss but Reiner�s New World still sounds splendid. It�s every bit as vibrant and self assured as one would expect but without any sense of excessively hard-driven tension. He draws particularly expressive playing from wind principals and from the ravishing Chicago string choirs (try the ecclesiastical piety of the melody line of the slow movement) and spices this with youthful playfulness. His Scherzo is ebullient and powerful and the finale sweeping but not overdone - and with tremendous inner rhythm. If, in the last resort, this isn�t quite as verdant a reading as the almost contemporaneous Paray it lacks for nothing in individuality and excellence of execution. It�s unfortunately the only commercial recording of a Dvoř�k symphony that he ever recorded. Coupled with it on this all-Czech disc is a driving and ebullient, though super-subtle Carnival and a good Bartered Bride overture; not as fizzy as some but with no false theatrics about it. The Polka and Fugue from Schwanda the Bagpiper is more than a mere postscript though one may have wanted more meat from the programme. It�s worth noting however that these were three composers with whose works Reiner was certainly familiar. It�s often overlooked that he shared the conducting duties at the Slovenian opera house in Laibach with Talich, a near contemporary, and one he greatly admired, though their New World recordings retain independence. Both revered Nikisch and both followed in Mahler�s footsteps; he�d conducted there about thirty years before. It�s not hard to trace the seed of Reiner�s enthusiasm for Czech music to these early days around 1910 when he was known as Friderik Reiner and engaged on important operatic work in the Municipal Theatre. He led Dalibor there, his only performance of that opera, though it�s true that his Smetana repertoire was limited. It�s a pity however that we have no Fall or Weiner from his Hungarian heritage; he was a strong advocate of the latter�s music and examples of, say, the Serenade for Small orchestra, the Divertimento after Old Hungarian Dances and the Pastorale, Fantasy and Fugue certainly showed up often in his concert programmes; and he did record the Divertimento in 1945 on 78, though never on LP. That said the total timing of this disc is perfectly acceptable. This is a SACD to which I�ve been able to listen only on an ordinary set up.